One day recently, my husband asked for jam. Since we have just moved and it was winter, I didn't have any frozen or stashed away jam to bring out on the spot. That meant I had to make some. And while I really wanted to make it, I was also feeling really tired and didn't feel like I could handle doing my usual jam, thickened with Pomona's Pectin. Because of all the steps required, it seemed overwhelming. I had to figure out how to make the easiest jam ever. So I figured I'd use chia seeds to thicken it, and I'd use the Instant Pot to cook it. Well, not only was it soooo easy… it turned out amazing! This Instant Pot jam is a keeper. We've made it several times since because it's oh-so-good and oh-so-easy! Oh, and the best part? You can sweeten with stevia only for no added sugar! The day my husband asked me to make homemade jam, I was very tired... So I had to figure out how to make the easiest jam ever! In moments like these, I pull out my Instant Pot: the king of easy healthy cooking! The result? 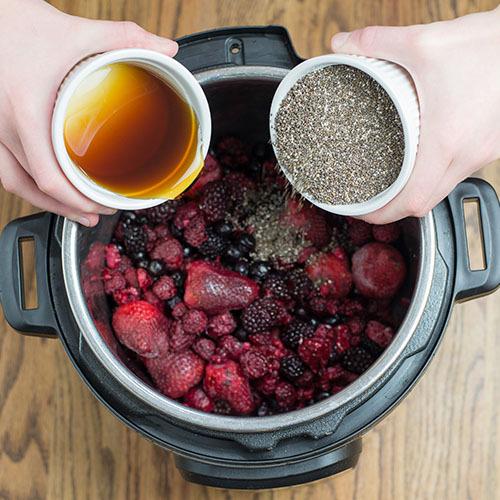 A mixed berry jam -- featuring a strawberry, blueberry, raspberry, and blackberry frozen fruit blend -- that calls for only 5 ingredients, including chia seeds to thicken it without pectin. For a sugar-free option, feel free to sweeten to taste with stevia. Put berries, sweetener (unless using stevia), lemon juice, and vanilla extract in the insert pot of pressure cooker. Cover the pot, checking the seal and components to make sure all is well. If using an electric cooker, set to high pressure for 6 minutes. If using a stove-top cooker, bring to high pressure and maintain for 6 minutes. When cycle is complete, turn off (if electric cooker) or remove from heat (if stovetop cooker). Let sit for about 10 minutes, until pressure has completely released naturally. If berries are not fully cooked, press the "Saute" function if using an electric cooker such as the Instant Pot. If using a stovetop cooker, place on burner over medium heat. Mash any large chunks of fruit. If using stevia, add a dropperful at a time. Stir and taste, adding more as needed. While stirring, pour in chia seeds. If pressure cooker isn't already on "Saute" function (if electric) or over medium heat (if stovetop), do so now. Let saute a few minutes, stirring occasionally, to allow chia seeds to thicken the jam. Turn off pressure cooker (if electric) or remove from heat (if stovetop). Transfer jam to quart size jar(s). Refrigerate, or this jam freezes well. Looking for more healthy condiments? Yes! Homemade Mayonnaise Is Easier Than Store-Bought! Have you ever made chia seed jam before? Do you like to use fresh or frozen fruit in your berry jam? 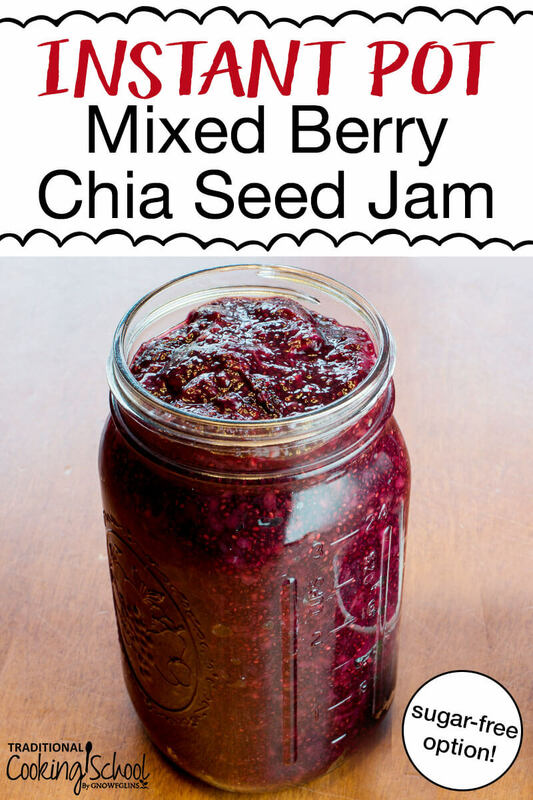 I’m interested in using chia seeds as a thickener for jam. I don’t have an instant pot or pressure cooker, and I don’t plan on getting one. Any thoughts on using chis seeds with the old fashioned way of making jam? You can 🙂 For this recipe, cook your ingredients over the stovetop until berries can be mashed. Remove from heat and stir in chia seeds. Let us know how it turns out! The jam should be keep for several weeks. Wardee says she’s keep hers for up to 4 weeks. Can you use this same recipe using fresh fruit instead of frozen? I don’t see why that wouldn’t work, Amanda. If you give it a try, please let us know how it goes! I’m going to try this right away! Do you use the fruit while it is frozen or should I thaw it?